But this is a flimsy attempt at a fig leaf and it is evident that the School-based Collaborative Committees will supplant the SLTs and really be in charge of making improvement plans for the school, while the Central Committee will take the place of the District Leadership Teams that also include parents. The School Committee shall meet twice monthly at a mutually agreeable time, including but not limited to during the workday, OPW and Parent Engagement time, throughout the school year and additionally as needed. 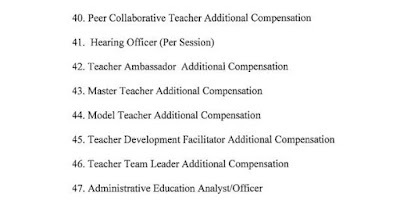 Trained facilitators selected and assigned by the Central Committee will assist and meet with the School Committees. So the extra eighty minutes per week that under Joel Klein was devoted to to small group instruction for struggling students, and then re-directed in the last teacher contract by Carmen Farina towards more PD and supposed “parent engagement,” is now going to be given up in these schools to School-based Collaborative Committee meetings, a collaboration which does not have to include parents. In all this seems to not only conflict with state law on SLTs but also the enhanced parent participation that is supposed to be required by ESSA in schools identified for comprehensive or targeted support. So what else will happen in these schools? “Schools in the Bronx Collaborative Schools Model will have priority consideration for centrally funded initiatives such as Equity and Excellence initiatives, air conditioning, physical education and others that align to the schools' goals. " But apparently not class size reduction, which actually might help them improve. 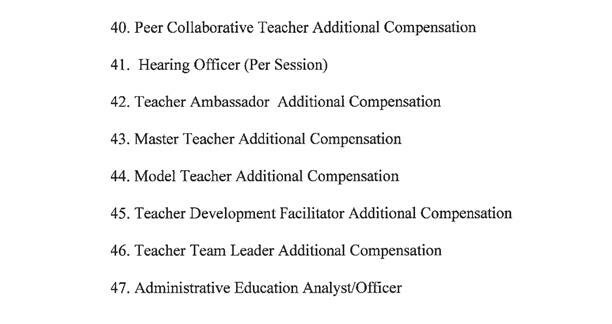 “The Teacher Development Facilitator shall receive additional compensation in the amount of $3,000 per school term for the term of this Agreement above the applicable teacher salary in accordance with this Agreement… The possible expansion of this role to include the support of new, in-service teachers will be determined by Joint Committee on Teacher Leadership Initiatives. If you discover anything more of interest in the MOA, please leave your comments below.